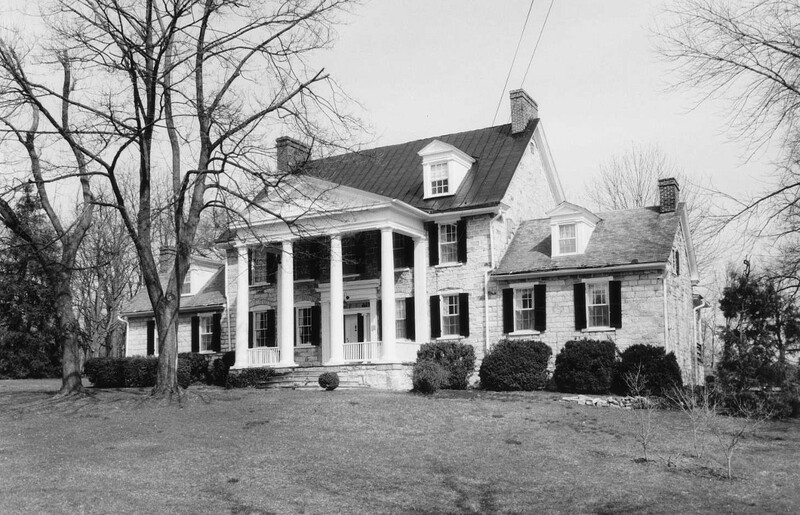 Springdale was originally the home of Jost Hite, the earliest European settler in the lower Shenandoah Valley. The ruins of what was probably Hite’s home and tavern, built in the 1730s next to the Indian trail that became the Valley Turnpike, still stand in the yard. The present dwelling, a large stone house in the German vernacular tradition, was built in 1753 by mason Simon Taylor for Hite’s son John. John Hite held numerous public positions including trustee for the town of Winchester. He was a friend of George Washington, who is recorded to have been a visitor at Springdale. Although the limestone walls survive without significant alteration, the interior and exterior trim, including the portico and dormers, date from mid-19th- and early 20th-century remodelings. The house remains a prominent landmark along present-day U. S. Route 11.